Guitar lessons at our Phoenix guitar studio. Kurt has been performing guitar and teaching guitar lessons in Phoenix AZ for more than 20 years. He received his B.F.A. in classical guitar performance from the University of Wisconsin and The Wisconsin Conservatory of Music with a principle study in classical guitar and a secondary in Jazz guitar. 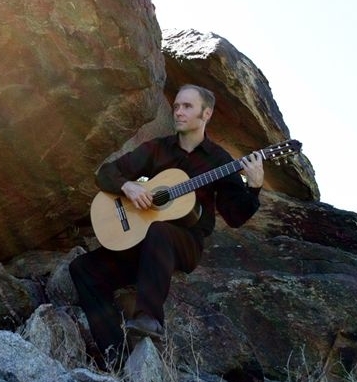 His guitar teaching and playing styles include rock, blues, jazz and classical guitar. You are sure to enjoy guitar lessons with Kurt as his relaxing personality and true professionalism effortlessly bring the results you seek. Secondary study in Jazz guitar. Literally thousands of private one on one guitar lessons! Q? What is the best age to Guitar lessons? Normally for guitar lessons; 7yr old is my minimum. Exception is personality. A 5yr old who can focus on guitar for 20min will work. So I say we can do a trial guitar lesson and I can determine if it will work. In Home Phoenix/Scottsdale Guitar Lessons Teachers , Phoenix Guitar Lessons/Teachers in our Studio.